Across Royal Caribbean's fleet of cruise ships, there are some interesting and unique staterooms that are slightly different than the rest of the staterooms in the same category. 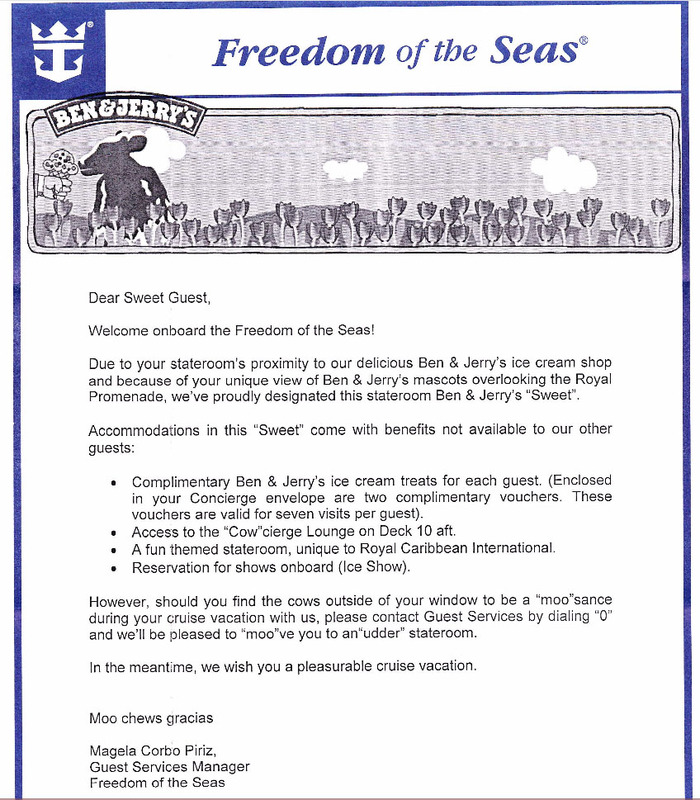 Today, we are looking at a very different Promenade stateroom on Freedom of the Seas that has a very unique look to it, the Ben & Jerry "Sweet". Stateroom 6305 on Freedom of the Seas (and also sister ships Liberty of the Seas and Independence of the Seas) is the only inside stateroom on a Royal Caribbean ship to be considered a suite. It is listed on deck plans as a normal cabin and not specifically mentioned in the catalog this "Ben & Jerry's" cabin is but one of the most unusual cruise ship cabins of all. The stateroom sits directly above the Ben & Jerry's ice cream shop on the Royal Promenade and so, the room has a view of the two cows that are prominently displayed by the shop. Thus, the view out the window is blocked. Royal Caribbean decided to embrace the Ben & Jerry's motif by transforming this room into the "Ben & Jerry Sweet". Throughout the entire room, there are cow sheets, pillows, pictures and other cow-related decorations. By far the free ice cream and concierge lounge access are the best part about this stateroom. Concierge access is usually limited to guests staying in a suite. Daily menus displayed and pre-ordering for your dinner wine. Reservations for any specialty restaurant, sports activities, shore excursions, salon and spa appointments. Would you want to book this stateroom? Tell us in the comments!